The original version of this report contained an error in Table 6.F3. The two rows under “Does not meet medical standards” were incorrectly labeled. The correct labels “Disabled worker” and “Disabled adult child” now appear in this report. The original version of this report contained an error in Table 2.F3. 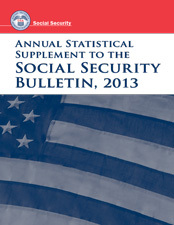 The number of “Total work years” for fiscal year 2013 was incorrect. The correct number now appears in this report.